To the uninitiated, Instagram is one of these new-fangled social media platforms. Being photo-based, you tend to find as much of the crazy content one finds on Facebook; so no ranting lunatics with extreme and unfounded political views and no banal “this is what I had for my dinner” posts. Instagram has however given a voice to a legion of shameless narcissists eager to show you exactly how wonderful their life is and exactly how uninspiring and moribund yours is by comparison. 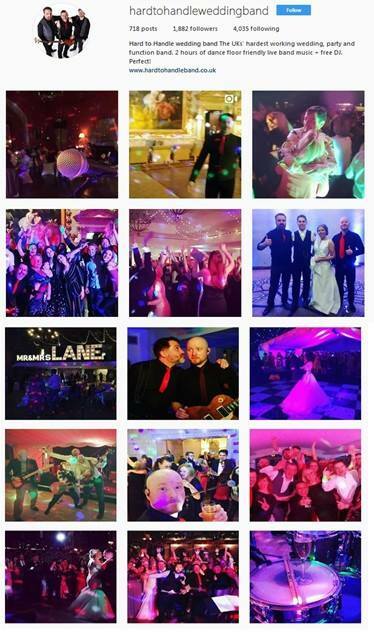 Here you will find literally hundreds of photos we have taken at the bookings we perform at. Unlike Facebook, you don’t need to sign in or have an account in order to access all of our content. That’s really useful, because the photos show you exactly what we do – entertain both small and large groups. You will see guests on the dance floor in various states of enjoyment. You’ll see photos of first dances (including some pretty awesome-looking wedding dresses and dapper groomsmen suits). 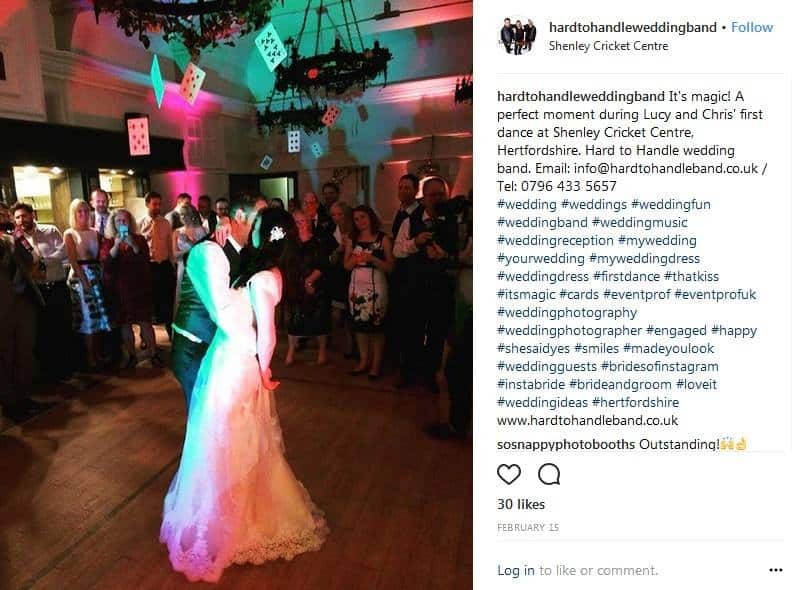 You’ll see how our lights bathe the whole wedding reception room in a glorious wash of colours; and you’ll see a LOT of smiling faces. There’s a reason for this – people are loving the evening. They’re loving having been invited to such a great party. They’re loving celebrating the occasion with friends and loved ones. 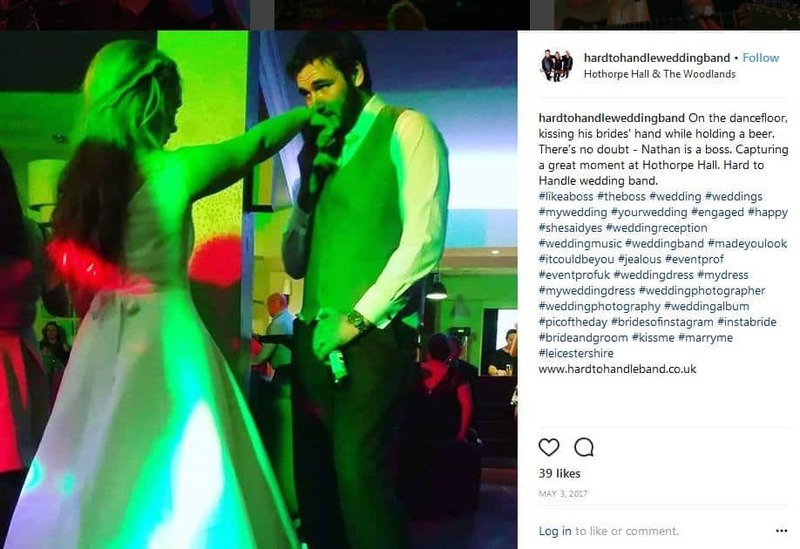 And if, like them, you have hired Hard to Handle band, your guests will be seriously loving the fact that you have created a real buzz by employing the services of professional live entertainment. So feel free to take a look at our Instagram account. 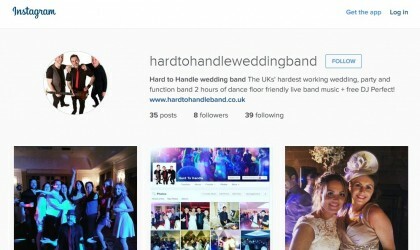 It’s social proof – a photographic document of how Hard to Handle band provide the “wow” factor at functions week in, week out. Like what you see? Let us know! Call us on 0796 433 5657 or email us at info@hardtohandleband.co.uk . You’ll be able to speak to us direct – no agencies, just friendly, professional musicians happy to talk. We look forward to hearing from you!